If you are in the Greater Boston area, please join us in Watertown this Thursday night at 6:30pm for a fun night of music for the whole family. Sponsored by the Watertown Family Network. The concert is free and sure to be a blast! Here’s a picture from last year’s crowd. The Debbie and Friends band and I hope to see you there! Here’s a link to more information. What an honor it was for Debbie and Friends to participate in Berklee’s Early Childhood Symposium on April 9, 2012. The symposium was sponsored by Berklee’s Music Education Dept, under the leadership of Dr. Cecil Adderley, and included presentations and performances by Paul Reisler, Cathy Fink and Marcy Marxer, and Debbie and Friends. It was a very special day with Berklee students, faculty, staff, and lots of families from the greater Boston area all focused on making music together. Here’s a picture of Berklee’s Music Ed Majors on stage with Debbie and Friends having a great time with the kids and families in attendance. This was particularly special to me being an alumna of that program. Berklee constantly strives to be a great place to learn, teach, and work. Events like the Early Childhood Symposium are just one more example of this. Our new song/cartoon “When You Were One” has been released! If you haven’t seen it yet, here’s a link to our YouTube channel where it is featured. The song celebrates a child‚Äôs life and special moments from ages 1-5. After receiving several requests, we are making the mp3 available to you to use as a soundtrack for your own family movies and slideshows. See the download link below. Please post your movies to YouTube with a hash tag #WYW1 so we can see your creations! Bring the kids! 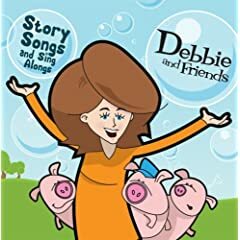 Debbie and Friends has a super fun show planned for the Regent Theatre in Arlington, MA this Saturday, March 24 at 10:30am! This will be our last Boston-area show until the summer. We hope to see you there! Here’s a new song and cartoon music video currently in production. The song is called “When You Were 1″ and it celebrates a child’s life and special moments from ages 1-5.¬†This song features Mike on vocals and has a big Randy Newman and Sara Bareilles influence. We hope you enjoy it! The finished version will be published in March 2012. Meet Jake, an honorary band member! I want to tell you about a special friend of mine named Jake. If you have our first CD or have seen our cartoons on YouTube, you’ve already heard his voice on our “Three Pigs and a Wolf” song. In fact, he introduces the song with his then 3-year-old voice, and sings along during the chorus parts with his brother Joshua and sister Riley. Here’s a picture from the recording session. Jake is now 10-years old, and he took up the saxophone just three months ago. He has gotten so good at the sax in such a short period of time that I invited him to join us on stage. Jake played the “Opposite” song with the band at the Coolidge Corner Theatre on Jan. 8, 2012 and stole the show! Here are some pictures from that performance. Jake did such a great job in fact, that we decided to make him an honorary band member with his own D&F cartoon character! Meet Jake, everyone! I think you’ll be seeing more of him on stage and perhaps even on screen in future D&F productions!